Mountain bikers climb a trail in April 2017 in what is known as the Haines parcel, acquired last year by the Bureau of Land Management. The Bureau of Land Management has begun the public planning process for the Roaring Fork Valley properties it acquired last year through the Sutey Ranch land exchange near Carbondale. After a high-profile, multi-year process to complete a land exchange with the owners of the Two Shoes Ranch south of Carbondale, the BLM in March 2017 acquired the 557-acre Sutey Ranch, located just to the north of the existing Red Hill Recreation Area. 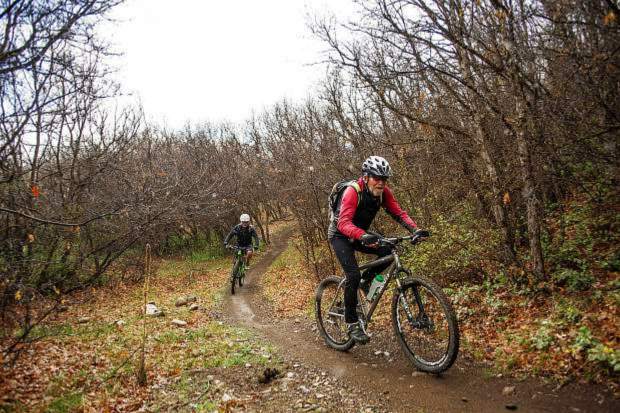 The deal also involved the 112-acre Haines Parcel along Prince Creek, at the base of the Prince Creek/Crown trails network that is popular with mountain bikers. In exchange, the Wexner family, owners of Two Shoes, obtained several parcels with little to no public access. “The Sutey Ranch parcel provides critical big-game habitat and has the potential to provide access to significant recreational opportunities” in conjunction with the Red Hill Area. Likewise, “the Haines parcel provides trail connections to popular mountain bike trails. “Public involvement will continue to play a critical role as we move forward with site-specific planning for the Sutey and Haines parcels,” Acting BLM Colorado River Valley Field Manager Gloria Tibbetts said in a press release. The BLM will be hosting a public open house from 4-7 p.m. July 12 at the Third Street Center, 520 Third St., in Carbondale, to help answer questions and take written comments. More information about the parcels and the planning process is available at https://go.usa.gov/xnvM5. Comments may be e-mailed to blm_co_sutey_haines_rmpa@blm.gov or mailed to BLM, 2300 River Frontage Road, Silt, CO 81652, Attn: Sutey/Haines Management Plan. Comments are due by Aug. 5. Information such as address, phone number or e-mail addresses may be made public at any time during the process. “While you can ask us in your comment to withhold your personal identifying information from public review, we cannot guarantee that we will be able to do so,” the BLM advises.